Donovan Ortiz made one a few standout defensive plays that helped North Arlington hand Saddle Brook its first loss of the season, 5-3, on Wednesday afternoon. SADDLE BROOK – As North Arlington sophomore Joe Witt took the hill on Wednesday he knew that every pitch was going to be an important one. Saddle Brook came into game with an undefeated record and a whopping 64 runs scored in just four games. But the Vikings were undaunted by the challenge ahead. Witt took it upon himself to set the tone with both his arm and his bat. His teammates followed his lead with timely hits and sparkling defensive plays to back him up. 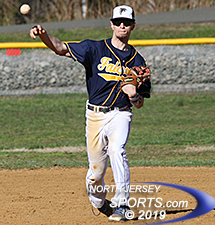 Witt pitched a complete game and went 4-for-4 at the plate as North Arlington handed Saddle Brook its first loss of the season, 5-3, at VanderSande Park in Saddle Brook. Not only had the Falcons scored 16 runs per game over their first four games, they allowed just four runs going into Wednesday’s game and never trailed at any point so far this season. That changed quickly as Witt stroked a base hit on the first pitch of the game and Donovan Ortiz singled to put runners on the corners with nobody out. Mike Roman lifted a sac fly as Witt barely beat a strong throw home by Saddle Brook centerfielder Max Cue. Ortiz moved up to second on the throw home then came around to score on a double by Tony Alho to give the Vikings an early 2-0 lead. Anthony Marchetto paced Saddle Brook (4-1) with three of the Falcons’ seven hits and he scored two of their three runs. Saddle Brook got one run back in the bottom half of the opening frame. Anthony Marchetto lined a leadoff double, moved up to third on a wild pitch and scored on an RBI single by Jason Muoio to trim the NA lead to 2-1. That is when the Vikings made the first of several key defensive plays by turning to a 4-6-3 double play to end the threat. The Falcons kept the pressure on and had runners in scoring position in the third, fourth, fifth, and sixth innings, but each time Witt got out of it by keeping the ball down and trusting the defense behind him. The biggest of those plays coming at second base from Ortiz in the bottom of the fourth inning. Vinny Traverso hit a hard ground ball that seemed destined go into right field to plate the tying run and two outs. Ortiz had other ideas as he laid out with a full extension dive to snare the ground ball. Then, in one motion, he spun on his knee and fired a strike to first to get Traverso by a step and preserve the lead. 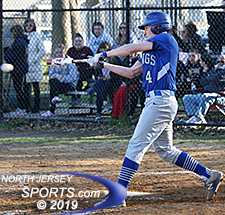 The lead was 3-1 heading into the seventh inning when North Arlington tacked on two insurance runs that proved to be the difference in the game. Eric McKenna’s two-run single bumped the lead up to 5-1. Witt got two quick outs to start the bottom of the seventh before things started to unravel. Marchetto singled and took second on runner’s indifference before scoring on a base hit by Muoio. Witt appeared to induce a game-ending fly ball off the bat of John Hacker but it was dropped. That allowed Muoio to score, Hacker to move to second and bring up cleanup batter Nick Cerbo as the tying run. With Witt’s pitch count now over 100 and the New Jersey pitch limit being 110 pitches, the right-hander had no choice but to go after Cerbo if he wanted to finish off the game himself. He spun a tight curveball over the inside corner for a called third strike to give the Vikings their biggest win of the season to date. Eric McKenna hit a two-run single for North Arlington, which evened it record at 3-3 on the season. Witt did it all for North Arlington (3-3). On the mound he gave up seven hits, just one earned run, with one walk and five strikeouts. At the plate, Witt (who is now batting over .500 on the season) had a perfect day going 4-for-4 with two runs scored and a stolen base. Roman also had a good day at the plate going 2-for-3 with two RBIs and a run scored. Marchetto paced Saddle Brook (4-1) with three of the Falcons’ seven hits and scoring two of their three runs. North Arlington will try to carry that momentum into another big NJIC-Meadowlands Division tile against Hasbrouck Heights on Friday.